Mike Heavey, a Former Legislator for the 34th District of the State of Washington and Retired Judge from the Seattle area will present "Amanda Knox - What Happens Now?". Two years ago Mike joined us for a presentation on Amanda and her ordeal with the Italian courts on the murder charge against her. Mike Heavey, a Former Legislator for the 34th District of the State of Washington and Retired Judge from the Seattle area, presented “Amanda Knox – What Happens Now?” Two years ago Mike joined us for a presentation on Amanda and her ordeal with the Italian courts on the murder charge against her. So far Amanda has been convicted, subsequently the verdict was overturned but in March, 2013 they threw out the acquittal and are retrying her. This is the update to this continuing drama between the Italian Judicial system and an American college student from Seattle, Amanda Knox. Mike Heavey, using his extensive background as a Judge, discusses the concept of confirmation bias and dismantles the prosecution’s outlandish theories and unsubstantiated claims. Bob Holert introduced Mike Heavey to give us an update on the Amanda Knox ongoing Saga. He said his entire presentation would be about “The Truth”. Mike Heavey spoke to us two years ago about her case and the differences in the methods used by the Italian police, judicial system and media to try her for the murder of her roommate, Meredith Kercher. Now, two years later, he came to give us an update on why her conviction was overturned and why she will be retried for the murder of her roommate. Background: Amanda Knox was a young woman from Seattle who, when she had just turned 20, set off in 2007 to a small university in Perugia, Italy, to enhance her Italian and “find herself.” Her roommate from England, Meredith Kercher, was murdered in November 2007. Rudy Guede was convicted of the murder in 2008. Knox and her boyfriend, Raffaele, were also charged with the murder of Meredith. She and her boyfriend were convicted in a 2009 trial and spent 1,437 nights in prison. In October 2011, they were acquitted of the crime (innocent). In March 2013, Italy’s highest criminal court overturned the acquittal of Knox and her boyfriend and has sent the case back to Florence to be re-tried. Mike Heavey gave us “the facts” about the case . Amanda and her boy friend were not at Meredith’s apartment the night of the murder. Rude Guede admitted to being with Meredith at her apartment the night of the murder. He did not call for medical help when he “found” her bleeding, he did not try to save her and he fled to Germany. He was convicted of the murder in 2008. Mike proposed that it was not possible that Amanda was involved in the murder. Mike said when Rude was arrested and later convicted, the Italians should have admitted the “truth”, admitted that they accidentally accused Amanda and Raffaele of the murder, and let them go. He proposed that it would have made the Italian police and judicial system look like fools so they continued to perpetuate the false accusations. Mike said that there are 5 tools of wrongful conviction: Inflammatory media, coercive interrogation, unreliable witnesses, junk forensic science and official misconduct. He gave us “facts” that proved that these were in place all through her saga. Italian courts have 3 verdict options. US courts have verdicts of either Guilty or Not Guilty. In Italy, a person can be found Guilty, Not Guilty (insufficient evidence to find guilt) or Innocent (did not commit the crime). In an official statement of their grounds for overturning the convictions, the judges wrote there was a “material non-existence” of evidence to support the guilty verdicts. They concluded she was “innocent”, a rarely used verdict. Why try her again? He proposed that Amanda may be entitled to large dollar compensation for wrongful conviction. His prediction is that the appeal will change the charge to “not guilty”, which will allow the Italian police, judicial system and public to save face and avoid a potential large financial payoff to Amanda. He asked us to “be a part of justice being done”. Write to your Congressman and the Ambassador and tell them what you think. President Scott Sadler opened the meeting. The invocation and pledge were offered by Adam Mihlistin who gave us a parable about a man who fell in the hole and needed help getting out. The first man to come by was rich who threw money in the hole and said “buy yourself a ladder”. Next, came a priest who prayed for the man but did not help him out of the hole. Finally, a friend came by and jumped in the hole. The poor man asked why the friend did not help him out. The friend said “because I have been here before, and I know the way out”. Adam then led us in the flag salute. 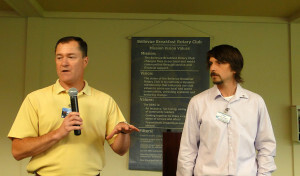 Chris Monger introduced two visiting Rotarians, Stanley from Seattle 4 and Corey Johnson from South Africa. There were many other guests in attendance who were introduced. Jim Kindsvater gave a presentation on Rotary Recognition for Roger Allington. He gave a kind overview of Roger and his wife, Reva. Roger and his wife both passed away last week. His service will be held Sunday August 11 at 12:30 pm at St. Peters United Methodist Church in Bellevue. Corey Johnson, the Executive Director of Imagine Scholar, revisited us after speaking to our club in November 2012. Mike Ralph announced that our club will sponsor one of the students, Enky, in South Africa for the upcoming year. Corey showed a short video update from Enky and thanked us for sponsoring her. Most of us knew Roger Allington as a gentle friend with a smile for all and a twinkle in his eye. Of course – as with everyone – there was a lot more to the man. Roger was born, raised, and educated in California, and spent the first 12 years of his working life there. In 1969 Roger moved to Alaska, working for the Department of Transportation, and then several Native Alaskan Corporations. 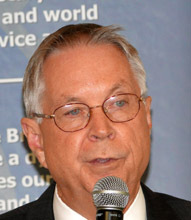 He moved to Beverly Hills, CA as Transportation Director in 1985 and retired in 1995. He moved to Bellevue in 2001 and was an active member of his church and community. 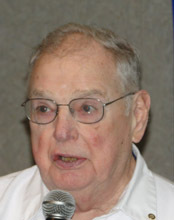 He joined the BBRC in 2005 and will be remembered for his work with Rotary First Harvest, writing for the Reveille, and lining up greeters for 5 presidents. Also, in 2001, he married his third wife, Reva, and they lived a marriage full of adventure, love, and a great deal of laughter. Reva was a bit of a maverick and Roger encouraged her fun. Adding Reva’s children to the clan Roger was known to be the grandfather of 17 and the great grandfather of many. Roger passed on last Saturday, shortly after Reva. His memorial service was held Sunday, August 11th, at St. Peter’s United Methodist Church. Roger actually asked for a Sunday Memorial as he didn’t want to inconvenience anyone and “they’d be at church already!” That was typical of Roger. He was a blessing to us all. 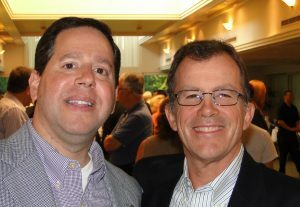 Jim Carney announced that the Committee Chairs will be gathering for a social time at the Bellevue Brewing Company on August 29 from 6-8 pm. Anyone is welcome to join them. Tim Leahy announced that the Third Thursday Fellowship will be held at the Bellevue Brewing Company on August 15 at 5pm. Adam Mihlstin announced the Major Grant Committee Meeting in the Bar after the morning meeting. Morris Kremen announced that the Rotary First Harvest work party will be tomorrow August 10 from 9-noon in Kent. Paul Osborne gave an update on the website. He said 20 clubs have now downloaded the template for use in building their own websites. He encouraged our members to help with updates to our website. Lennie Lutes announced that there will be a golf committee meeting every Tuesday at the Bellevue Square Starbucks at 7:30 until the Golf Tournament. The first was “you cannot expect justice from a court of chickens”. The second was attributed to Bill Cosby: “Parents are not interested in justice, they are just interested in peace and quiet”.